Need some time away? Discover a private hideaway, just for you in our Elliott Room at Hawthorn B&B. Nestled on the third floor, this quiet, private, cozy room with a queen bed is the perfect place to rest your body and mind and rejuvenate your spirit. The Elliott Room is a peaceful retreat decorated in soothing taupe and lavender and accented with Wendy’s favorite flowers, pansies, as well as seaside items reflecting Jim & Wendy’s New England roots. The private bathroom has a standing shower with glass door, generously sized towels, a hair dryer, an assortment of soaps, shampoo, lotions, and makeup remover towelettes. Awaken in the morning to the aroma of a freshly brewed coffee, then experience your specially prepared, full, home-cooked breakfast awaiting you at your private table. Contact us and start making plans for your relaxing getaway today. 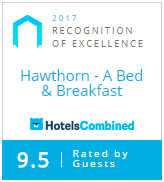 We look forward to hosting your stay! Thank you for such a wonderful relaxing time! Your house is so warm and welcoming. I immediately felt relaxed. Everything in every single room is beautiful, and I especially enjoyed our conversations. You both have a way of making your guests feel like old friends.